Carlos Ghosn's bail application was rejected again, even after the fallen car titan offered to wear an electronic tracker and be monitored by guards to end his custody that has now lasted more than two months. The latest rejection by a Tokyo court is a win for the prosecutors, who can now keep Ghosn detained as they continue to build their case ahead of an eventual trial that could be as long as six months away. The former Nissan Motor chair had also offered to surrender his passports and give shares as collateral. His downfall, as sudden as it was unexpected, has roiled the two-decade alliance between Nissan and France's Renault SA, which he dominated as chairman of both companies and of the entity that governs their partnership. France's Finance Minister Bruno Le Maire and Nissan CEO Hiroto Saikawa were both quick to downplay a report in the Nikkei newspaper over the weekend that the French side was planning to put the two carmakers under one holding structure. Since Ghosn's initial arrest, prosecutors have repeatedly extended his detention and re-arrested him over new allegations, while defence lawyers' several bail applications have been refused. Ghosn’s lawyers, represented by Motonari Otsuru, made a fresh application for bail on January 18. Ghosn's previous requests for release envisioned him heading to France, where he's a citizen, before returning to Japan for trial. In his latest bid, Ghosn pledged to stay in Japan and gave a Tokyo apartment rented by his family as his address, whereas in his previous applications he had given a Paris address and a residence at the French embassy in Tokyo. He also offered to refrain from contact with anyone who could be a witness against him. 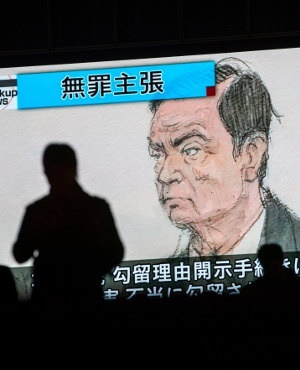 Japan's legal system has faced criticism for a lack of clarity and communication on how prosecutors are handling the case, with Ghosn held in detention without charge for longer than would be permitted in the UK for a suspected terrorist. While the Tokyo court didn't give a reason for Tuesday's bail rejection, a judge at a January 8 hearing said Ghosn’s continued detention was because he presented a flight risk and posed the danger of witness and evidence tampering. "The reason for the bail dismissal should be clarified," said Nobuo Gohara, a lawyer and former prosecutor in Japan who isn't connected to the case. Gohara said he had expected the latest bail request to be successful because the terms Ghosn offered would have made it practically impossible for him to destroy evidence. Even a highly-restricted release would have allowed Ghosn to more easily prepare for trial. As is customary in Japan, while in custody he's been extensively interrogated without his lawyers present and has no access to documents that could help him construct a defence. He has also been barred from seeing or communicating with his family. Renault DecisionWhile Nissan fired Ghosn almost immediately, he still retains his posts at Renault and at the alliance -- though probably not for much longer. Michelin Chief Executive Officer Jean-Dominique Senard is expected to join Renault’s leadership, people familiar with the matter have told Bloomberg News. The people emphasised that no proposal was made at the meeting and it’s too early to discuss concrete plans, asking not to be identified because the deliberations are confidential.